In Tarot for May 2019, The Star is the arcana that dictates what will happen and it represents the enjoyment of life, as well as hope and faith in the future. Without a doubt, this card has nothing to do with the other cards that precede it, such as The Tower or The Devil. It generates much more tranquility and serenity than the sensations that the previous ones create for new consultants. 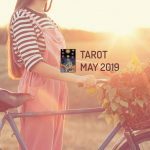 In Tarot for May 2019, The Star is the card that dictates the month and it brings luck. In this card, which has the number seventeen, is the figure of a naked woman pouring water from the amphorae that she has in each hand, pouring one onto the ground and another onto the water. Behind her you can see stars in the sky and a bird perched on a tree. This bird is the symbol of humans’ souls. The Star is the first manifestation of a heavenly body among the cards, appearing first and then being followed by both the Moon and the Sun. It shows a calm woman in a fertile environment, and although her position reflects a type of passivity, the truth is that it is indicating that something will happen soon. The figure that this tarot card represents is linked to the goddess of love of the Babylonians, known as Astarte, who is equivalent to the Egyptian God Isis, and of course closely related to the Greek Aphrodite and the Roman Venus. Therefore, all the links with the goddesses of love make it a positive card, likely to enjoy life, which is why she lets the water spill from one of the amphorae onto the earth, to be able to enrich the land and so that it generates fruits she can benefit from. And the action of letting the water run can also be interpreted as a sign of faith and confidence in the future. A sign that if we do things well, we will receive the fruits of our efforts in a while. It helps to sow hope. In Tarot for May 2019, The Star indicates positive events, good luck, pleasure and friends. On a sentimental level it could mean the return of an old love that we had forgotten about. A magical but ephemeral moment, because relatively soon things will be back to how they were before, although they will leave a fantastic and emotional taste in our mouths. As for health, it encourages us to live in a vegetarian and hedonistic way, enjoying what nature has to offer. Regarding money, the investments we made some time ago are now beginning to pay off.